Lovely quartet, and the trains ain't bad too. 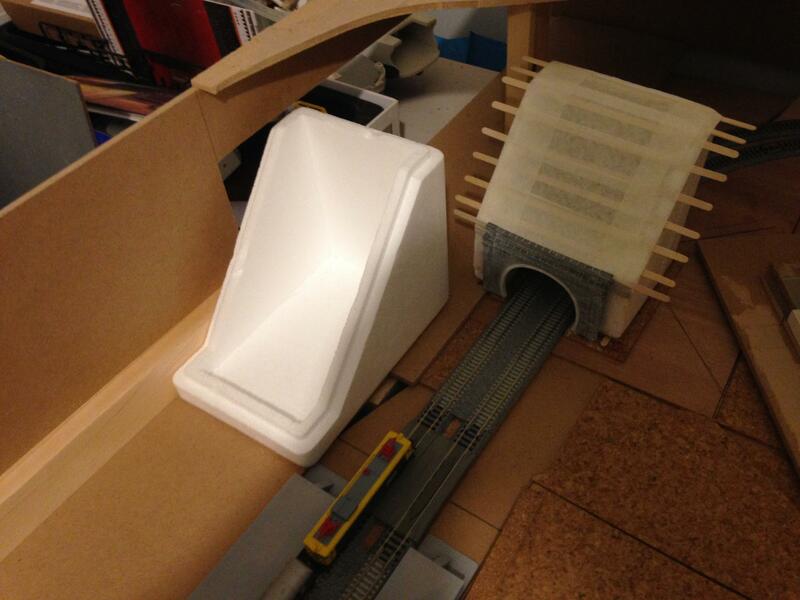 The tunnel was made using one of the white polystyrene things on the left. My wife has marine fish tanks and while I was at the aquatic shop getting some stuff for her I saw a whole load of these in a trolley which were going to be thrown away. 'Help yourself, we don't want them was the answer' so if you think they might come in handy for various scenery projects, tunnel mouths, bridges etc. they come in twos and contain frozen fish food packets which they take out and put in an open freezer, then chucking out the containers. 'Tis a sad day in Izaro today as the house is going on the market next month, I'm going to be in plaster for 3 months from January and we will probably have to stay in a transition house (if that's what you call it), which isn't big, for a while next year. 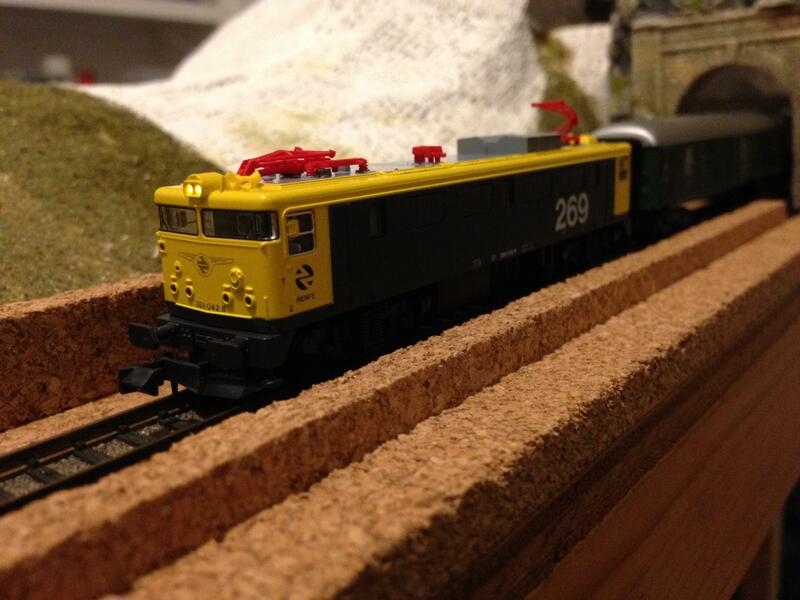 The room needs to be clearer and anything train related needs to be small and portable. SO, it's dismantle time . The idea is not lost though and Izaro II will hopefully reappear in 2019. In the meantime I have decided (with the other half's permission of course) to go back to the Port Regleun Brittany layout but keep it simple and portable. Remember I was standing on a chair on the landing to take this so the room is rather cluttered. 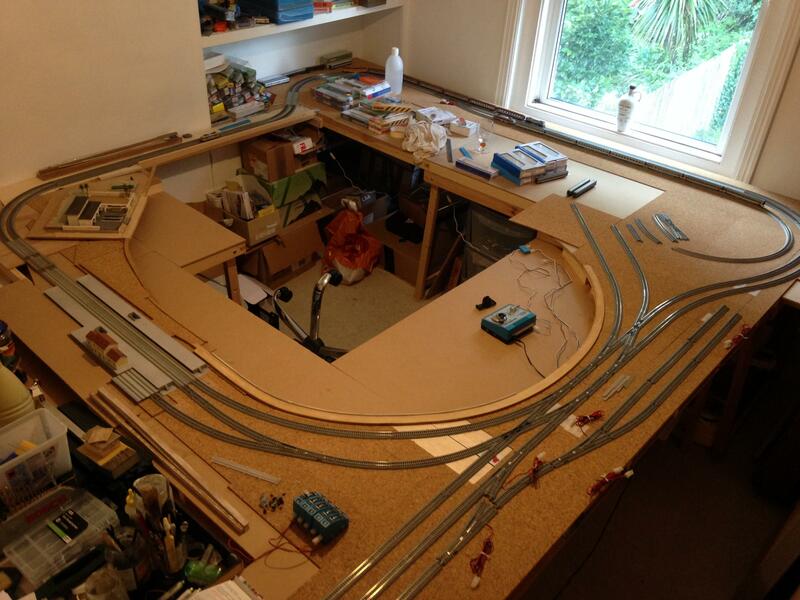 Anyway, the plan is to keep the board in front of the window as just a test track oval with sidings in the middle as the Kato track can be easily taken up and boxed. The trestle tables pack up nicely and can go in a shed. That's a bridge but mine would be a causeway to save money. The port area would be maybe 4' x 2' so it and the turn square should be portable enough and be able to be stored under a bed. The two lengths as well but if they have to go so be it. Will start a new thread soon but just wanted to explain. Thanks for the interest, kind comments and 'thank yous' about Principat d'Izaro and as I said it will be back! Now where's my sledge hammer? Sorry to hear the bad news, but at least you'll have something to look forward to. Looking forward to Izaro II indie course. Hope you find a suitable transition house that works for you. Good luck with the op and move. Being plastered for three months is something to look forward to. Not so good having to demolish something that has taken time and effort to make. Something Spanish from my collection. An old Ibertren UT440 unit. 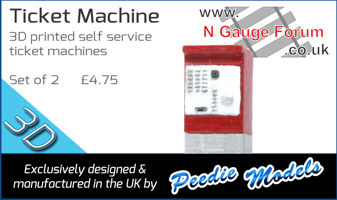 I'd like to get hold of the red/white model they also made, just for completeness! I've been looking for one of those for ages. Did see one on ebay from Spain a while back but funds were low and the postage was ridiculous. In a way I'm glad you posted at this time or I would have gone into want one, want one stroppy child mode. Cheers for the pic. Reminds me of the train I used to get occasionally into Madrid when I was there for a while. I've been looking for one of those for ages. I have a thing about E.M.U.s, especially the Arnold ET420s (must have a dozen of those). 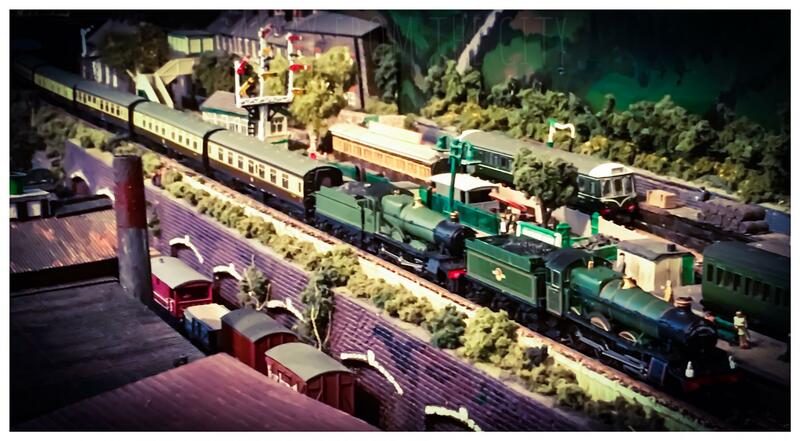 I was at a show a few years ago, and there was a guy selling off all his N gauge. This particular 2-car set was there, but I didn't buy it at the time. A few days later I contacted and he still had it. Think it cost me £50. It took me a while to find an additional centre coach. 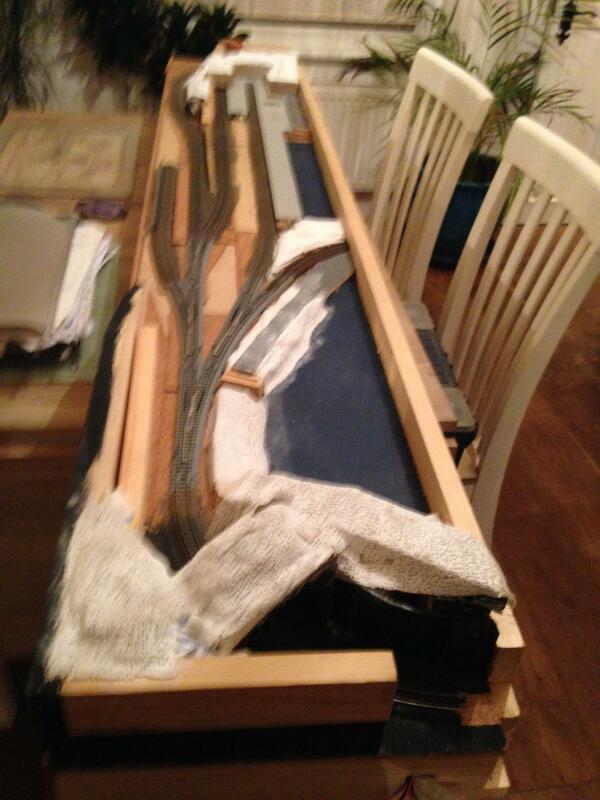 A mate of mine actually got one from a boot fair ages ago but he cut it up to experiment with scratch-building!!! I now have the parts. Finally managed to get hold of the one in the photo to make up a 3-car set. Can't believe twas a year ago that I had to dismantle the layout. 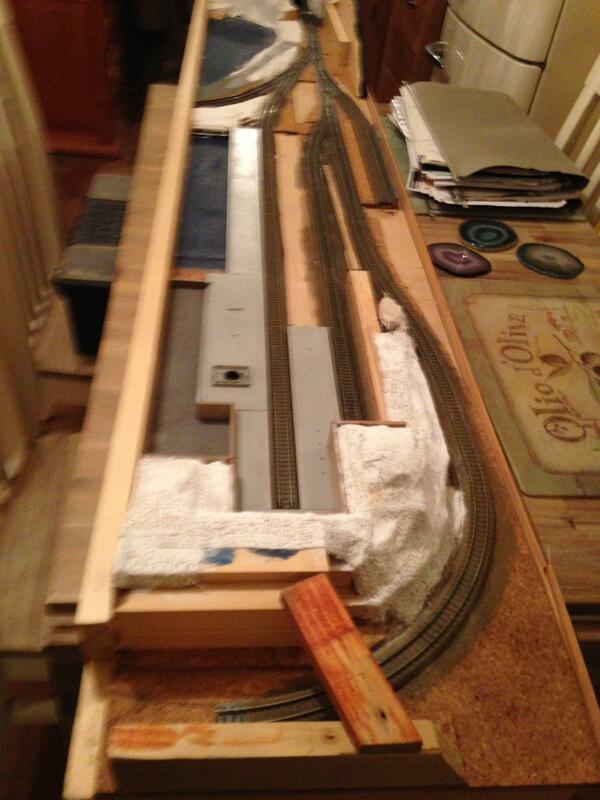 Anyway, there is a little resurrection for it in that I found a small layout that was my first attempt at Kato track. I thought I had dismantled it but found it while clearing out a lock up that we will not be using anymore. 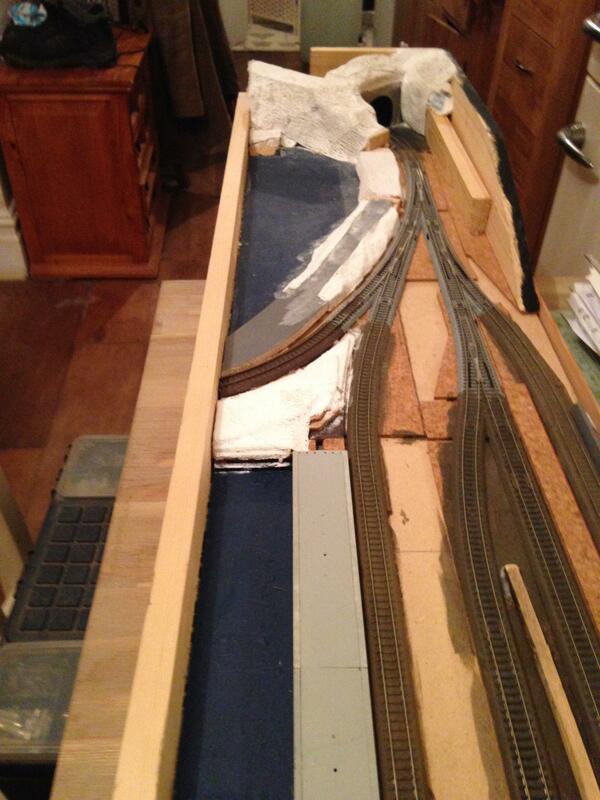 For those following my Trémargat St. Croix (TSC) layout, I have a 69" x 16" lift out section with hill and bridge between the harbour and a small fiddle yard. The newly found layout, which was going to be a roundy roundy, with some revamping, should fit in and so I thought I could have a beachside terminus for a part of Principat d'Izaro and be able to run Spanish and Southern French trains around the TSC harbour to stretch their legs and then use the terminus for photo opportunities. Hope to incorporate the El Gaitero restaurant from the original layout last year over one of the tunnel mouths and keep the mojo espanol going. 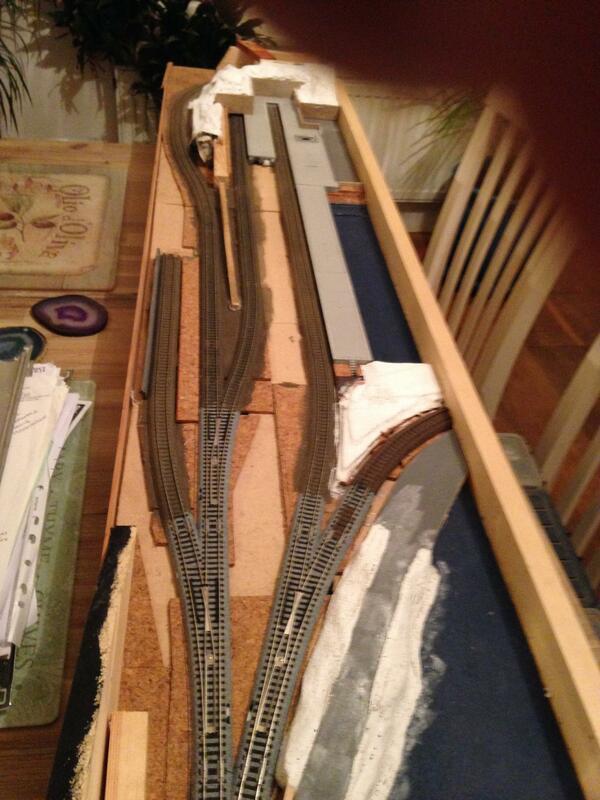 It's a bit of a mess and I need to remove the branch going to nowhere and remove some edging wood but if the track works it's nice to have a new project with some of the work done already. Well the lift out section bit didn't work. 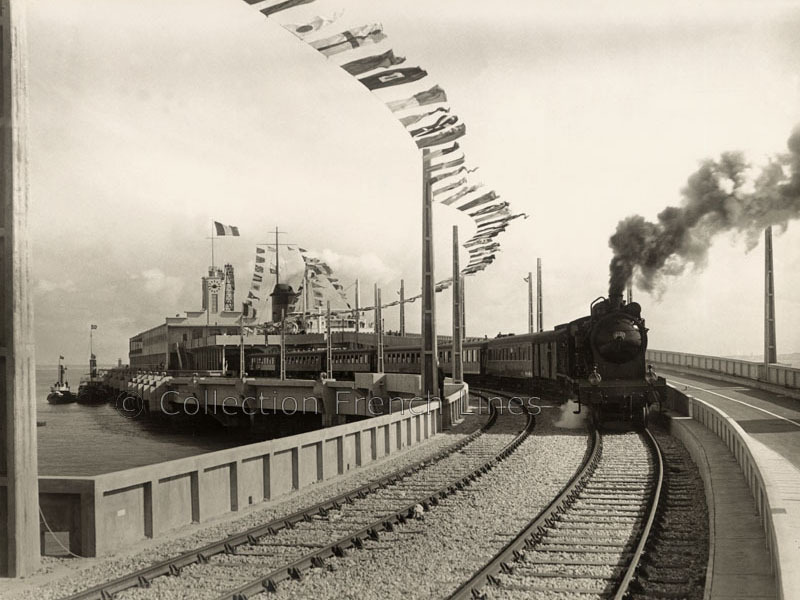 There's a proper (ish) explanation on my Trémargat St. Croix thread so won't bore you all again. Anyway, the good news is I also had another old layout with a bit of scenery and track so have decided to revamp that instead and make it a stand alone part of the Principat d'Izaro peninsular. It's up and running, although just a single oval and small terminus station (probably Estepera beach) and lots to do but I can run Spanish and Southern French trains to keep the mojo going. I'll do a proper explanation this evening but just wanted to see if I could post a pic after the upgrade. I have other pics but I'll try one and then post later. Have had a rethink on a few things so need different photos now and waiting on some glued things to dry but hopefully some proper pics soon. Hope we're all back and running now. Edit PS Meant to say haven't painted the sea/beach wall yet. All will become clear. 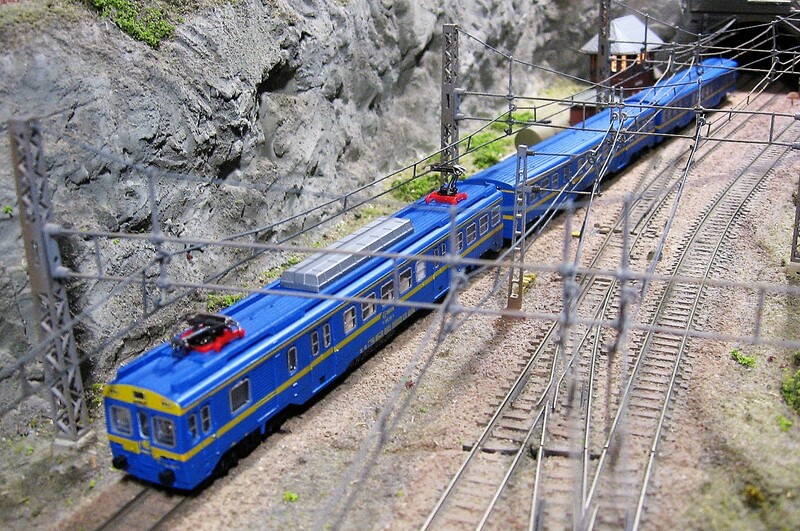 Also, I can't do weathering but will do something with the red pantographs as they're just wrong. Some sort of black wash perhaps.